‘The distribution of satellite galaxies orbiting a computer-simulated galaxy, as predicted by the Lambda-cold-dark-matter cosmological model. The blue circles surround the brighter satellites, the white circles the ultrafaint satellites (so faint that they are not readily visible in the image). The ultrafaint satellites are amongst the most ancient galaxies in the Universe; they began to form when the Universe was only about 100 million years old (compared to its current age of 13.8 billion years). The image has been generated from simulations from the Auriga project carried out by researchers at the Institute for Computational Cosmology, Durham University, UK, the Heidelberg Institute for Theoretical Studies, Germany, and the Max Planck Institute for Astrophysics, Germany.’ Institute for Computational Cosmology, Durham University, UK/ Heidelberg Institute for Theoretical Studies, Germany / Max Planck Institute for Astrophysics, Germany. Physicists have discovered that some of the faintest satellite galaxies orbiting our own Milky Way galaxy are amongst the very first that formed in our Universe. Findings by a team of academics, including physicists Professor Carlos Frenk and Dr Alis Deason from the Institute for Computational Cosmology (ICC) at Durham University and Dr Sownak Bose from the Harvard-Smithsonian Center for Astrophysics in America, suggest that galaxies including Segue-1, Bootes I, Tucana II and Ursa Major I are over 13 billion years old. Their findings are published in The Astrophysical Journal. Professor Carlos Frenk, Director of Durham University’s ICC, said: “Finding some of the very first galaxies that formed in our Universe orbiting in the Milky Way’s own backyard is the astronomical equivalent of finding the remains of the first humans that inhabited the Earth. It is hugely exciting. Cosmologists believe that when the Universe was about 380,000 years old, the very first atoms formed. These were hydrogen atoms, the simplest element in the periodic table. These atoms collected into clouds and began to cool gradually and settle into the small clumps or “halos” of dark matter that emerged from the Big Bang. This cooling phase, known as the “cosmic dark ages”, lasted about 100 million years. Eventually, the gas that had cooled inside the halos became unstable and began to form stars – these objects are the very first galaxies ever to have formed. With the formation of the first galaxies, the Universe burst into light, bringing the cosmic dark ages to an end. The research team identified two populations of satellite galaxies orbiting the Milky Way. The first was a very faint population consisting of the galaxies that formed during the cosmic dark ages. The second was a slightly brighter population consisting of galaxies that formed hundreds of millions of years later, once the hydrogen that had been ionized by the intense ultraviolet radiation emitted by the first stars was able to cool into more massive dark matter halos. 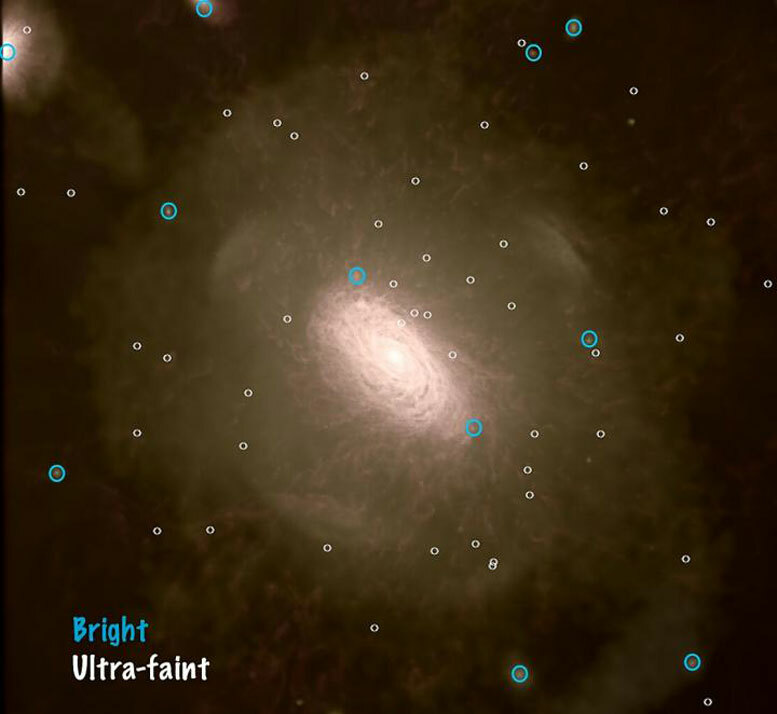 Remarkably, the team found that a model of galaxy formation that they had developed previously agreed perfectly with the data, allowing them to infer the formation times of the satellite galaxies. Dr Sownak Bose, who was a PhD student at the ICC when this work began and is now a research fellow at the Harvard-Smithsonian Center for Astrophysics, said: “A nice aspect of this work is that it highlights the complementarity between the predictions of a theoretical model and real data. The intense ultraviolet radiation emitted by the first galaxies destroyed the remaining hydrogen atoms by ionizing them (knocking out their electrons), making it difficult for this gas to cool and form new stars. The process of galaxy formation ground to a halt and no new galaxies were able to form for the next billion years or so. Eventually, the halos of dark matter became so massive that even ionized gas was able to cool. Galaxy formation resumed, culminating in the formation of spectacular bright galaxies like our own Milky Way. 1 Comment on "Physicists Identify Some of the Oldest Galaxies in the Universe"
Certainly all cosmologists don’t believe this, right? How about the idea that God just spoke it all into existence? Why all this insistence that the creation of the universe had to take millions or billions of years? If He created this world in six days, like He said He did in Ex. 20:11, why would He have to take so long to create everything else?